It's my great privilege to be a resident artist at Wesley Seminary this fall, and I'm excited to be in Washington D.C. as well........excited to be learning all that is to be learned and shared here. They are very generously also giving me an opportunity to realize my "Circle of Hands" piece, which has been in my imagination for a long time; now to figure out how to execute it. Finally I can get this image out of my head and on to a wall! Yesterday I had a brief conversation with a young woman who mentioned that spirituality (or religion) is often discouraged, almost "taboo" in the world of contemporary art. I had to agree, although perhaps things have changed a bit since the 1980's when I received my MFA. 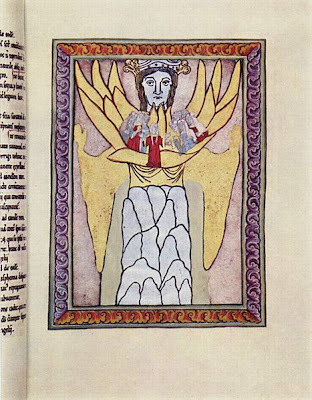 I remember emerging from that time with a body of work ("A House of Doors" and "When the Word for World was Mother") very much concerned with metaphysical and spiritual exploration, and felt quite angry at the resistance I received at the U.A. for my subject matter. 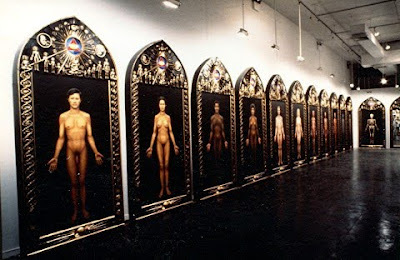 I had an enormous desire to find out who, what, and where art and spirituality were united in contemporary life. So I did what I've always done, took off travelling on a "vision quest" that lasted almost 5 years, visiting California and New York City, and points in between. The result was a collection of interviews I intended to make into a book called "Seeing in a Sacred Manner"; the book was never published, although some of the interviews were published with the kind permission of those artists who granted them to me, among them Alex and Allyson Grey (The Sacred Mirrors), Rafael Ortiz (Physio-Psycho-Alchemy), Rachel Rosenthal (Pangaean Dreams), Kathleen Holder (The December Series), and others. In retrospect, I wish I could have made their conversations more available to others, because what they had to say was so profoundly inspiring to me, and so important to others seeking to understand the same questions. Artists in our world have an "identity crisis". We are surrounded with structures that say art is important - schools, museums, galleries, magazines, books, churches. And yet, a contemporary practicing artist is often not given credit for pursuing her or his profession, often not seen as doing something with social significance. I cannot tell you how many times people have asked me what I do, and afterwards responded with "so what's your real job?". We define value in monetary terms, and equate quality or "professionalism" to how much money a "product" makes - which is an insane way to evaluate the "worth" of an innovative work of art, or any innovative work for that matter. Many of the greatest, and most profoundly transformative, contributions to our world had no "monetary value" whatsoever. Among them, the works of poets such as Rainier Maria Rilke, Rumi, and Gary Snyder, the solitary musings of Emerson at Walden Pond, the great visions of Lakota Medicine Man Black Elk and Hildegard von Bingam. When Van Gogh went into the fields to ecstatically paint the energy he saw in sunflowers or a star strewn night sky, when Georgia O'Keefe gathered bones she found in the New Mexico desert and contemplated them in her studio, when Louise Nevelson found pieces of cast off wood and furniture in the rain- slick streets of New York city.....they were not thinking about anything except the beauty and story they each saw, the creative energy that welled up from that source. Jesus of Nazareth lived as an itinerant teacher, living no where except where he was offered a place to sleep, asking no money for the teachings he offered to all who came to listen and to learn. I can think of no greater example. I often think of Bali, the amazing way art making, ritual making, music making are so much a part of daily life, from the woven offerings that women make first thing in the morning to the elaborate festivals held on specifically auspicious days. For the Balinese, art is a devotional activity, constantly renewed within the traditions of their Hindu religion. "Vision that responds to the cries of the world and is truly engaged with what it sees is not the same as the disembodied eye that observes and reports,that objectifies and enframes. 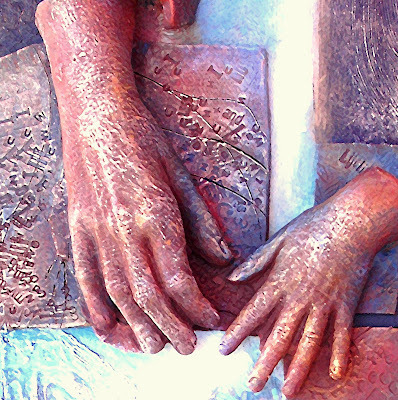 The ability to enter into another's emotions, or to share another's plight, to make their conditions our own, characterizes art in the partnership mode. You cannot define it as self-expression - it is more like relational dynamics.......Partnership demands a willingness to conceive of art in more living terms. It is a way of seeing others as part of ourselves." So what is "art process"? Well, for me art is a spiritual practice. I think if one considers it in that light, it becomes so much easier! Making art gets me out of the tyranny of my mind, and into a greater world of seeing, sensing, color, light......being. Sometimes (like with the "Prayers for the Dying" series I did this winter) it helps me to understand grief, to heal emotional losses or conflicts. Increasingly, I am interested in sharing the creative process with others, finding ways to connect with others in creative community. "It is through the poetry of myth, mask and metaphor Spiderwoman comes alive. The rock surface of an ancient petroglyph site is merely a veil between the observer and the other transcendental realms; it becomes a portal through which to enter the world of Spider Woman. As others have written before me: "She is with me now as I tell you these stories." I'm crossing this great country now enroute to Washington D.C. for my residency at the Henry Luce Center for the Arts at Wesley Seminary. I find myself reaching again for the almost transparent strand Spider Woman has cast my way, and felt like reviewing some of my writings from 2007 (my "Spider Woman's Hands" project at the Midland Center for the Arts) as I head east. 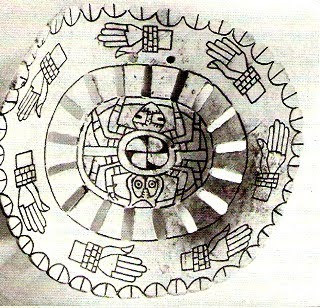 Mississippian "Spider" Gorget, ca. 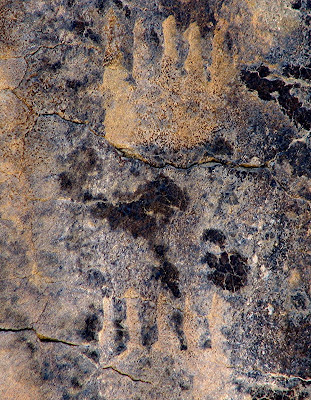 1,000 a.d.
Grandmother Spiderwoman is also called "Thought Woman" by the Pueblo people of the Southwest. She is a Creatrix deity found among the Navajo, the Lakota, the Zuni, Hopi, and Pueblo peoples, and images of "Spider" are found among prehistoric peoples throughout the South and Midwest. Perhaps the earliest representations of a Spider Woman (who was also associated with the Earth Mother) are found among the Maya. I have always felt inspired by this ancient myth, which for me is a metaphor on many levels. Spider Woman's threads weave from the center of life, a symmetry of interdependency. We are all Relations. Years ago I was enjoying a panoramic view of the Sonoran desert. I happened to be sitting near a spider web stretched between two dry branches. I realized, by shifting my point of view, I could view the entire landscape through the web’s intricate pattern…..revealing a vast landscape, seen through the ineffable, shining strands of an almost invisible web. Perhaps, that was the moment Spider Woman first captured my imagination. 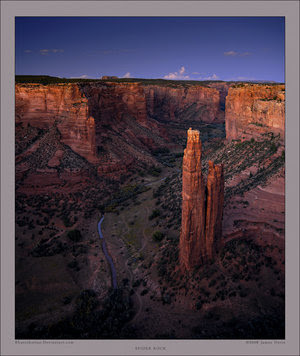 I knew that the Great Weaver of the Navajos, who they believed lived on top of Spider Rock near Canyon de Chelly in Navajo country, was revered because she taught them how to weave. Weaving is a sacred art. In Navajo rugs, “Spider Woman’s Cross” is sometimes seen, a symbol of balance or completion, the 4 directions. 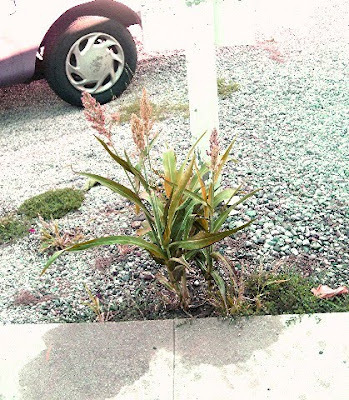 T0 this day, a bit of spider web is rubbed into the palms of infant girls, so they will become a good weavers. 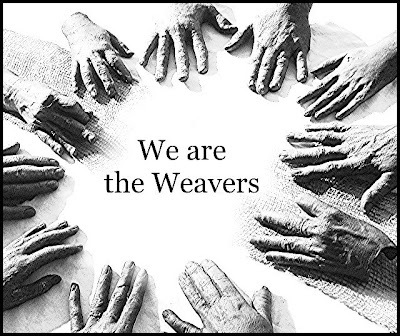 Another story I've heard is that weavers often leave a flaw in the work - because the only perfect web is that of Grandmother Spider Woman. 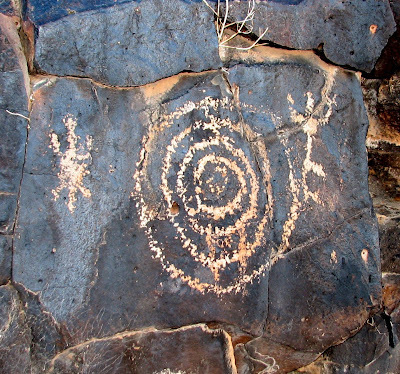 As anthropologist Carol Patterson-Rudolph has commented, to the Navajo Spider Woman is an initiation into a more expanded and interconnected way of seeing. She is able to bridge the sacred and prosaic dimensions of life - but for those who are not ready, Grandmother Spider will be invisible, nothing more significant than an insect so small she can sit on a shoulder and never be seen or heard. And yet, for those with eyes to see, her Web is everywhere. In Pueblo mythology Spider Woman is also called Thought Woman. With Tawa, the Sun God, She spins the world into being with what she imagines, with the stories she tells. I love this notion of creation - from her very being Spider spins silken, transparent threads that she organizes into patterns, ever expanding in complexity and scale. Tse Che Nako weaves her threads, sharing the creative power with all of her descendants. We participate in the weaving and the telling. 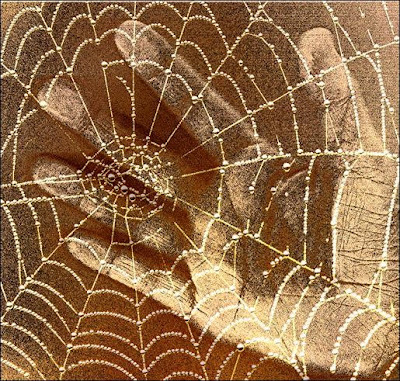 Like the Spider Woman we conceive with our minds; but we “weave” the stories of our lives with the manifest works of our hands, bringing the imaginal into the physical. 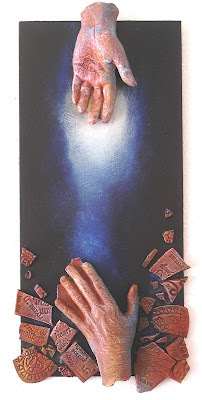 In 2007 participants in the community art project Kathy Space and I created in Midland cast their hands to make “personal icons”, united by a thread connecting them to each other. Because Spider Woman’s many hands are our hands, weaving our stories and dreams into the world. 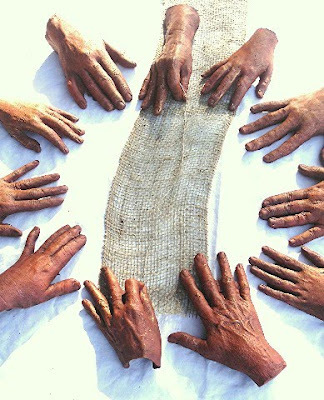 Casting our hands honored the unique creative powers each possesses, honoring our abilities to become "conscious weavers“ with that which is ineffable. 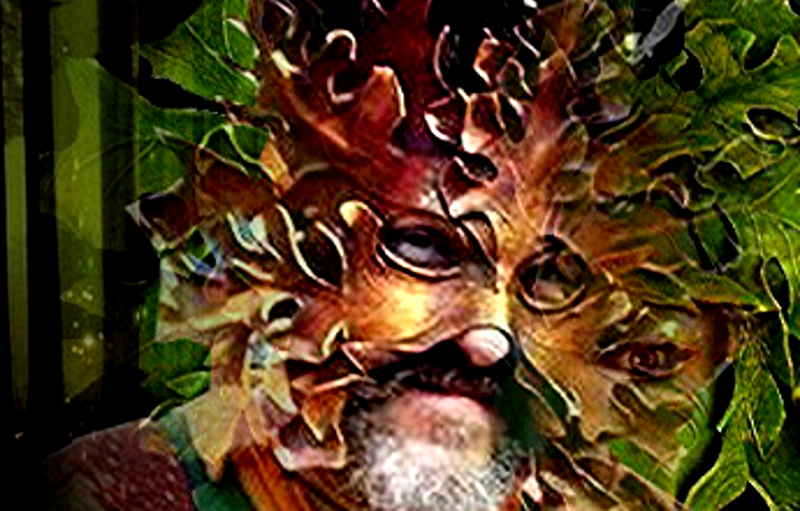 A spiritual paradigm is founded upon mythic roots - the "warp and woof” from which ideas grow. 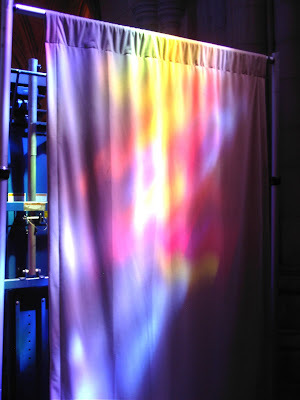 Following the metaphor theologian Katherine Keller has provided in her book "From a Broken Web" - can we can find contemporary mythic models that allow us to envision our world as it really is – a shimmering web of interconnected relationships, and ecology of being. Can we find ways to "see the world with a webbed vision”? may we then rub a bit of spider web into the palms of our hands. 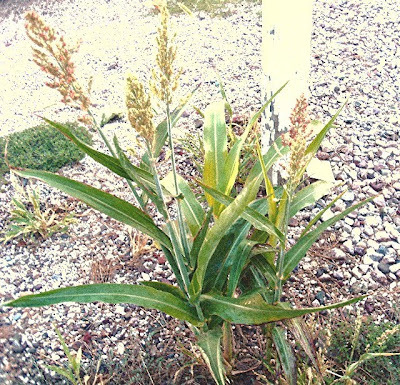 I wanted to share this cornucopia of various grains, including this beautiful plant ripe with berries, that has been growing exactly front of the number post (in the lot where I parked my motor home) when I came to Tucson in June. There is nothing else like it anywhere else, as far as I can see, and the rest of the lot is devoid of vegetation. As I prepare to leave, I reflect that I felt as if the Corn Mother left me a little blessing for the endeavors of this summer, a little "nourishment", a little reminder. I have not failed to be charmed every morning since, and pouring water on this lovely gift as a libation has become my morning ritual . It's all a gift, a blessing of enormous generosity. I just want to affirm that, here, and every morning. Gratitude. I think that's what I most want to express in my article The Mask of Sedna about the Inuit myth (soon to be published) on Coreopsis A Journal of Myth and Theatre is ultimately about - our urgent need to remember that our relationship with our Living Earth must be based upon gratitude, and an understanding of spiritual as well as physical reciprocity and responsibility. And I'm grateful as well to this wonderful new magazine, founded by mythologist and performance artist Lezlie Kinyon. I felt like sharing this poem, which I wrote on a long ago. The colors and taste of it! framed by an open window. and a blue-eyed cat, sleeping on the windowsill. Oh, praise the light, and all windows! with or without me to listen. who regards me from mirrors. I'd like to share briefly some info about the Cape Farewell project, an international organization founded by British activist David Buckland. 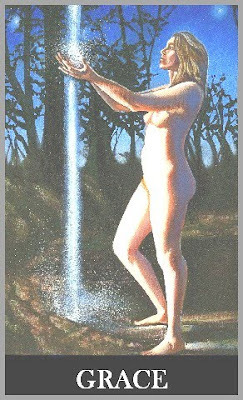 As I just finished,finally, my last revision of "Restoring the Balance", a 2004 ritual event developed from the Inuit myth of SEDNA (the completed article is printed in a previous (July) post), it seems timely that Cape Farewell should be mentioned. "The Arts are a core part of the Cape Farewell project: one salient image, sculpture or event can speak louder than volumes of scientific data and engage the public's imagination in an immediate way. The High Arctic, for myriad reasons, provides a place for real artistic investigation. It is on their journey to the world’s tipping points that our artists and scientists begin their conversations, which lead to further research and production of pioneering new work. Since 2003, these expeditions have proved to be the linchpin in the Cape Farewell portfolio, aiming to provoke and evoke a cultural response to the true scale of how the earth’s environment and climate are changing. The artists have found new and innovative ways to represent this extraordinary place and the implications of climate change. From the expeditions has sprung an extraordinary body of artwork, educational projects and collaborations. Explore the art, exhibition and events pages to find out more." Above is one of my favorite quotes by this couragous American writer and activist, Gretel Ehrlich. She has lived as a filmmaker in Los Angeles and a ranch hand in Wyoming, written about being struck by lightening and about herding sheep in the prairies, has travelled to Greenland to speak with the people who lived there, and went far into the Arctic to listen to the stories the land had to tell her as well. She is truly one whose art is her life. 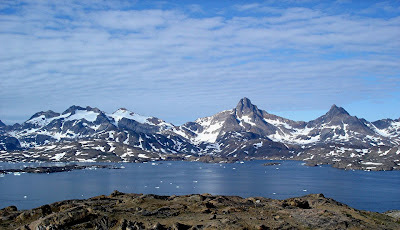 Gretel Ehrlich joined the Cape Farewell Project on their first Art/Science Expedition in 2003, on a voyage from Tromsø to Spitsbergen via Bear Island. Cape Farewell is an international organization that support environmental art and exchange between scientists and artist to raise consciousness about global change. Gretel has published many works of non-fiction, fiction, and poetry including: The Solace of Open Spaces, This Cold Heaven and A Match to the Heart. 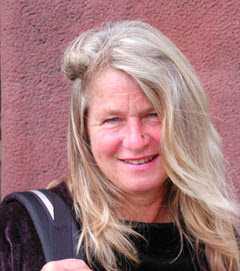 She has visited Greenland ten times, resulting in a book, This Cold Heaven, a National Geographic story on the effect of climate change on traditional hunting culture in January, 2006, a National Public Radio report, and a forthcoming film. She is also the author of The Future of Ice, a non-fiction work on climate change the includes the first Cape Farewell voyage to the Arctic. Gretel Ehrlich spent the year 2007 on a circumpolar journey meeting with Arctic people in villages across six Arctic nations, in order to hear about their lives - past and present - and how they are being affected by climate change. Her book, Farthest North, about indigenous Arctic people and climate change, is forthcoming from National Geographic Books in 2009. It explores the ways in which the changing climate has already affected their icecaps and landscapes, their lives and traditions. Arctic ecosystems are in a state of collapse and the remaining subsistence traditions of these boreal cultures are vanishing with them. To read a good interview with Robert Birnbaum about This Cold Heaven , follow the link, or visit the excellent literary website IdentityTheory.com. Robert Birnbaum is the Editor at Large. To examine or order some of her books, including "This Cold Heaven" and "The Solace of Open Spaces", visit the Good Reads site. I'm in the middle of finals for my ESL certificate program, which has taken up pretty much 24/7 for the past month. So, dear friends and colleagues, forgive me if I've not been very conversant. I've been immersed in a fascinating world of international students and the roots of Language Acquisition, and a group of fellow explorers, many just out of college and eager to see the world, but many like me as well. Retired? Never! Just creating a new career, a new path, a new adventure. Increasingly, I realize that there are no finalities. It has been wonderful to meet people from around the world.........and I've occasionally become teary-eyed sitting with young people from the Ivory Coast, and China, and Saudi Arabia, and Korea, and Brazil, and Ecuador, and Sumatra......all immersed in finding ways to communicate, to speak with each other. All needing each other to do so. So wish me luck. Off I go to the library to do something I haven't done in a few decades. Cram for a test!